I love to create in glass, and I deeply love my pets. 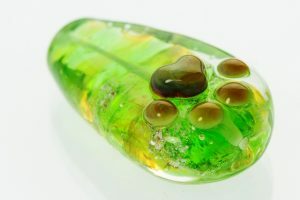 Being able to honor their life in glass pet cremation jewelry has been an incredibly fulfilling journey. It starting with the ashes of my beloved forever dog Madison. I struggled with the decision to create glass with Madison’s ashes in it for a long time…. 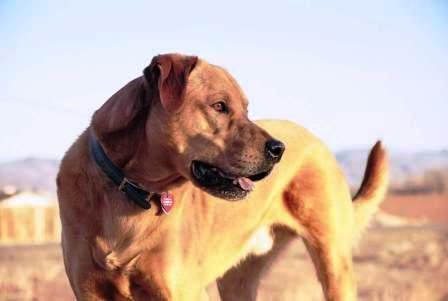 I just wanted to have a reminder of his gentle spirit and loyalty with me, something much “closer” than the urn he was in. After much questioning and many tears, I finally opened the urn and began. My heart soon filled with a warm calm and deep joy. I really truly felt –finally– that doing this was absolutely right. My designs were inspired by the desire to have jewelry I could wear often, which didn’t look like typical cremation jewelry. 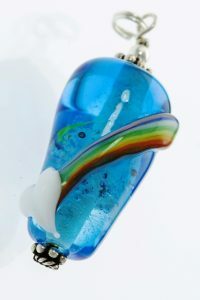 The beautiful “Rainbow Paw” is one of my favorite pendant designs, being inspired by the lovely Rainbow Bridge Poem. It has a paw shaped cloud on one end, and a heart shaped cloud on the other. I have a TouchStone design I created which I always carry with me. The sweet paw texture is very soothing to hold and touch. Other comforting TouchStone textures include simple bumps, and a very ancient symbol, the spiral of life. And you’ll love the gentle glow that comes from a GlowGlobe, by using special glow-in-the-dark powder during the creation. It also includes a small oak stand to hold your glass safe, while allowing sunlight to shine through. I am proud to be able to offer the same comfort to you. Please contact me at 877-347-5090, or go to my Pet Memories in Glass website to see and order more styles and designs. Thank you.